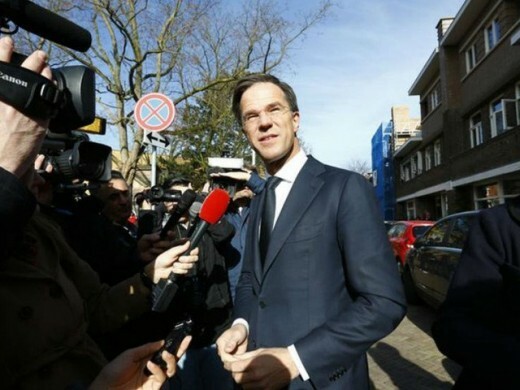 Amsterdam, The Prime Minister of Holland sets the new example of simplicity. When the coffee was dropped on the floor, he wiped it with his wiper and video of the cleaning of the floor was gone viral on the social media. According to media of Holland, the prime minister, Mark Rutte was present in the parliament and he was passing through a door and the cup of coffee was dropped from his hand and coffee was spread on the floor. He did not feel any hesitation and got the wiper and started cleaning the floor smilingly. He also used cloth to clean the floor and the edge of a table stained with coffee. You can watch in this video that the women appointed for the cleaning there watched his exemplary initiative and they clapped for him. The interesting situation was appeared when the women told the PM that he is bending to clean the floor. Then the ladies enhanced the length of the wiper and made it equal to the length of his shoulder so that he does not need to bend while cleaning the floor. Listening to this, Mark Rutte smiled and he completed the remaining part of the cleaning. Any member of the staff made this video and he uploaded in on the internet, which went viral across the world. The people of Holland and all over the world liked his style and they admired him by declaring it worth followed.